Sci-Fi Collectibles, T-Shirts, Patches, Etc. 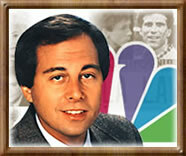 Brandon Tartikoff passed away August 27, 1997, a victim of Hodgkin's Disease which he battled for 25 years. The legacy of Brandon Tartikoff will never be forgotten. Brandon Tartikoff "Child of Television"
Born on Long Island, New York, U.S.A., 13 January 1949. Educated at Yale University, New Haven, Connecticut, B.A. with honors 1970. Married: Lily Samuels, 1982; one daughter. Director of advertising and promotion, WTNH-TV, New Haven, 1971-73; programming executive for dramatic programming, WLS-TV, Chicago, Illinois, 1973-76; manager, dramatic development, ABC-TV, New York City, 1976-77; writer, producer, Graffiti; director of comedy programs for NBC Entertainment, Burbank, California, 1977-78, vice-president of programs, 1978-80, president, 1980-90; chair, NBC Entertainment Group, until 1991; chairman, Paramount Pictures, 1991-92; independent Producer from 1992. Recipient: Tree of Life Award, Jewish National Foundation, 1986; Broadcaster of the Year, Television, Radio and Advertising Club of Philadelphia, 1986. Some folks also referred to Brandon as the "Steven Spielberg of television". 1997 Mars Pathfinder Photos: A Spielberg hoax?